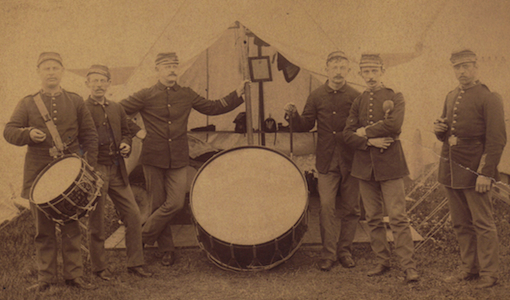 An interesting old photograph was recently brought to my attention by Drum & Fife instructor Pete Emerick. The photo was uncovered in an antique store located in Gettysburg, PA which specializes in military antiques. 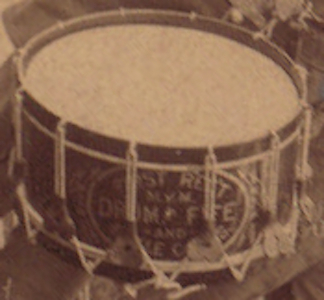 Handwriting on the back of the photo identifies the snare drummer as none other than George Burt Stone and states that the photo is of the Camp M.V. Militia at the turn of the century. I believe the abbreviation M.V. stands for Massachusetts Voluntary. The uniforms worn by the men in the picture narrow the date down a bit further I am told, roughly to between 1886 - 1895. The drum carried by Stone reads "FIRST REGT. / M.V.M. / DRUM * FIFE / AND / BUGLE CORPS" which corroborates the inscription on the back. The drum itself looks to be a typical late 19th century rope drum with leather ears, metal rim clips, and wooden hoops. No distinguishing makers mark is apparent on either drum in the picture. The most interesting feature of of either drum is the large descriptive emblem painted on the snare drum shell. George B. Stone had an extensive background in military music and this photograph provides a rare glimpse into the life of a man who would go on to be best known for founding George B. Stone & Son in 1890. Special thanks to Peter Emerick for sharing the image with me and allowing me to post it here! As always, you can send Lee an email at lee@vinson.net.